For the first time, researchers culture a bacteria that uses a magnetic sulfide compound to navigate. 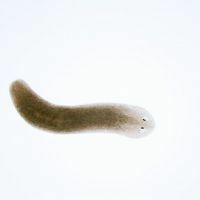 After 20 years of trying, researchers have finally succeeded in culturing a bacteria species that uses a magnetic sulfide compound to swim towards food. The findings, reported today (December 22) in Science, may shed light on how creatures first evolved, and help researchers grow the compound for industrial applications. “The biggest significance is that they’ve been able to isolate and grow magnetotactic bacteria that produces greigite in pure culture,” said University of Minnesota geophysicist Bruce Moskowitz, who was not involved in the study. "You have to figure out exactly what they like to eat, under what conditions they like to live, and those can be very difficult to mimic in a test tube." But now that the bacteria are happily living in culture, there’s no limit to the questions researchers can ask about their biology. Inside their cells, magnetotactic bacteria grow chains of 40- to 100-nanometer-long magnetic particles to help them align with the earth’s magnetic field. These tiny compasses allow the water-borne bacteria to swim back and forth in one direction, rather than wiggling around in three dimensions in a more random hunt for food. While researchers have cultured several forms of magnetic bacteria that make iron oxide, or magnetite particles, to navigate, bacteria that carry iron sulfide particles called greigite have been much more elusive. Ever since the greigite-producing bacteria were discovered more than two decades ago, University of Las Vegas microbial ecophysiologist Dennis Bazylinski has been trying to culture them. “We made all sorts of attempts over the years but with just no luck,” he said. The project had fallen by the wayside until he got a new postdoc, Christopher Lefèvre, who was eager to culture the greigite-bearing bacteria. The team visited lakes around the southwest United States to determine the conditions needed for the bacteria. The bacterium they ultimately cultured, which has yet to be named, came from a salty spring near Death Valley. Lefèvre, Bazylinski, and colleagues then set about a laborious trial-and-error process to determine the optimum conditions for growing the bacteria. They created a medium that mimicked the salinity of the Death Valley water, a complicated carbon source as food, and an anaerobic growing medium rich in sulfur. 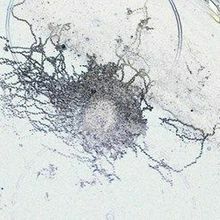 At first, they could grow the bacteria, but they produced only magnetite. But a final tweak to the culture conditions, and that the bacteria started producing greigite. They also analyzed a segment of highly conserved ribosomal DNA to get a sense of where the bacterial fit in the tree of life. The greigite-carrying bacteria were sulfate-reducing bacteria, but formed their own unique group. 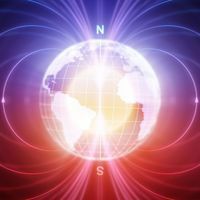 The researchers also identified two clusters of genes for making magnetic particles—unlike bacteria that make only magnetite, which have only one set of genes for making magnetic particles—possibly one for making magnetite and one for greigite. The cultured bacteria should allow researchers to investigate when bacteria first evolved the ability to make magnetic particles. "The process of forming highly ordered mineral structures or crystalline inorganic structure is something that’s broadly conserved or found in many different types of organisms," such as clams or even humans, who make bones and teeth, said University of California Berkeley cell biologist Arash Komeili, who was not involved in the research. The magnetic-particle forming ability of the bacteria is thought to be a primitive ancestor of that biomineralization process, so studying the bacteria in culture may tell us something about those evolutionary roots, he said. Once they identify the key sets of genes responsible for greigite production, researchers could conceivably create the particles on an industrial scale by inserting those genes into other organisms, such as E. coli, he added. Though it’s not clear what those particles would ultimately be used for, its counterpart magnetite is already industrially produced for applications such as MRI contrast agents. 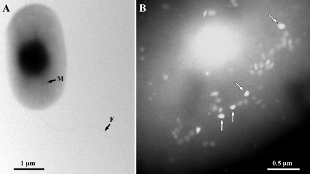 C. Lefèvre, et al, “A Cultured Greigite-Producing Magnetotactic Bacterium in a Novel Group of Sulfate-Reducing Bacteriam” Science, 334, pp. 1720-1723, 2011.